In recent weeks, most of the meaningful action in the financial markets has been focused on currencies. The euro has very much become the darling of the markets and both the dollar and sterling are under some considerable pressure. At the end of 2016, the dollar reached a high of 1.0384 against the euro and looked set to test parity, or at least that was the general view in the markets. As is often the case, when the markets get lined up in a certain direction, price action very often takes an about turn and moves in the opposite direction. This is exactly what has happened since the beginning of the year. On Tuesday, the dollar reached 1.1767 against the euro and the dollar looks primed to weaken further. 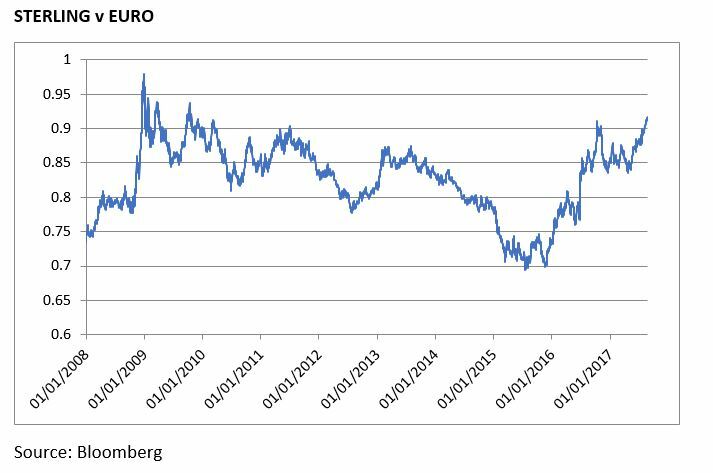 Against sterling, the euro has reached a high of 91.65 pence against sterling this week, which is the strongest level the euro has attained against the UK currency since late in 2009. 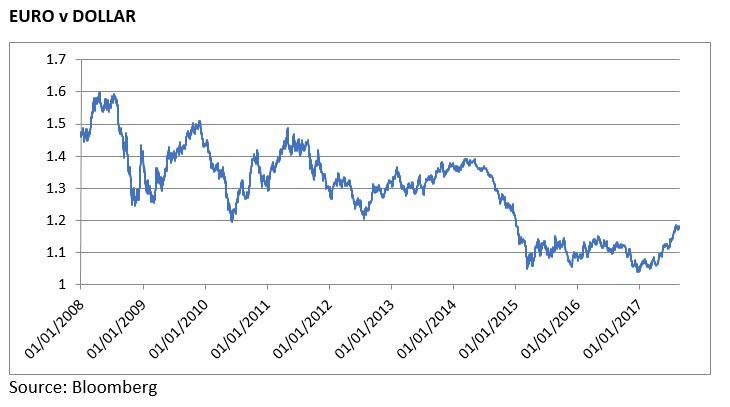 At the end of 2015, this exchange rate relationship stood at 69.60 pence. The subsequent exchange rate movement has been pretty dramatic by any stretch of the imagination. In any exchange rate relationship, there are always two sides to the story. The euro is being supported by the gathering strength in the recovery of the Euro Zone economy. In the second quarter, annual growth in the Euro Zone reached 2.2%, which is the strongest growth rate since early in 2011. Back in 2011, the growth performance did not look in the least sustainable and the economy very quickly went into the doldrums and went through a horrendous period, helped by policy mistakes from the European Central Bank (ECB). Today, the growth recovery looks more balanced and more sustainable and the ECB is likely to have learned its lessons and will not prematurely tighten monetary policy. The headline inflation rate is well behaved at just 1.3%. The weakness of the dollar is being driven by political, rather than economic factors. The US economy is doing reasonably well and the labour market in particular is looking very strong. However, the politics are all wrong. The handling of the North Korean situation and the response to the Charlottesville riots by the President have not inspired confidence. In addition, the personnel situation in the White House is quite farcical. The problem is that given the vulnerability and policy mistakes of the Administration, it is not clear that President Trump will have sufficient political strength and support to push through his economic agenda, the most important elements of which are a cut in the corporation tax rate from 35% to 15%; income tax cuts; and a broad public infrastructure investment programme. These policies had proved very supportive of US equity markets and the dollar, but the chances of them being implemented are dissipating fast, and US assets look vulnerable as a consequence. The weakness of sterling is being driven by many factors. The UK economy is losing momentum, with growth of just 1.7% in the second quarter of 2017; inflation is running at 2.6% and is coming under considerable upward pressure due to the impact of currency weakness on import prices, and most of all, sentiment towards the currency is poor due to the interrelated issues of Brexit uncertainty and political uncertainty. Last week, the UK government issued a position paper on the UK’s post-Brexit trading relationship. Basically, once the UK leaves the EU in March 2019, the UK Government wants to have an interim arrangement whereby it would remain part of the EU Customs Union for a defined period, but at the same time would be free to negotiate its own trade deals with third countries. The EU Customs Union is the element of the EU that allows goods to be traded freely between the member countries; goods imported into the EU from outside only have one customs process to come through; a common external tariff applies to third-country trade; and any trade deals negotiated with third countries, must be done by the whole customs union block rather than by individual countries. Hence last year for example, we saw the EU conclude a trade deal with Canada, rather than any individual country within the EU. This trade deal (CETA) comes into force next month. The UK Brexit position paper goes on to suggest that once the interim time period is over, seamless customs borders would be put in place between the EU and the UK. It is hard to see what a seamless border might look like, unless the second option outlined in the position paper is put in place, namely, a new customs union deal between the EU and the UK. The problem here is that the EU would struggle to ensure that once goods enter the UK from a third country, correct tariffs and duties apply before they enter other EU countries from the UK. It looks like a logistical nightmare and looks quite unworkable. It seems inconceivable that the EU-27 would allow the UK leave the EU, remain part of the Customs Union for a defined period, while at the same time remaining free to negotiate trade deals with other countries. From an EU perspective, such an outcome would represent a total nonsense and it is impossible to see what the possible upsides for the EU would be from such an arrangement, and the potential downsides are quite significance as it would undermine the whole basis of the EU. One way or another, it seems clear that the whole Brexit process is becoming ever more chaotic by the day, and the UK side has not got a clue as to how the whole situation might unfold. The big complicating factor is of course domestic politics, whereby the Prime Minister is struggling and will inevitably struggle a lot more to placate both the pro-Brexit side and the “remain” side. Against this pretty awful and uncertain background, sentiment towards sterling is deteriorating at a steady pace and it does appear likely that sterling could fall further over the coming weeks and months given how poor sentiment towards the currency is at the moment. Last week, Morgan Stanley forecast that the euro/sterling exchange rate would move through parity in the first quarter of 2018. No forecaster can be certain or arrogant about currency movements, but the risks to sterling look pretty compelling at this juncture.